what could be more appropriate to welcome me back from my blogging hiatus than this charming coozy (cuzy) (coozee) captured photographically on my latest journey to florida? 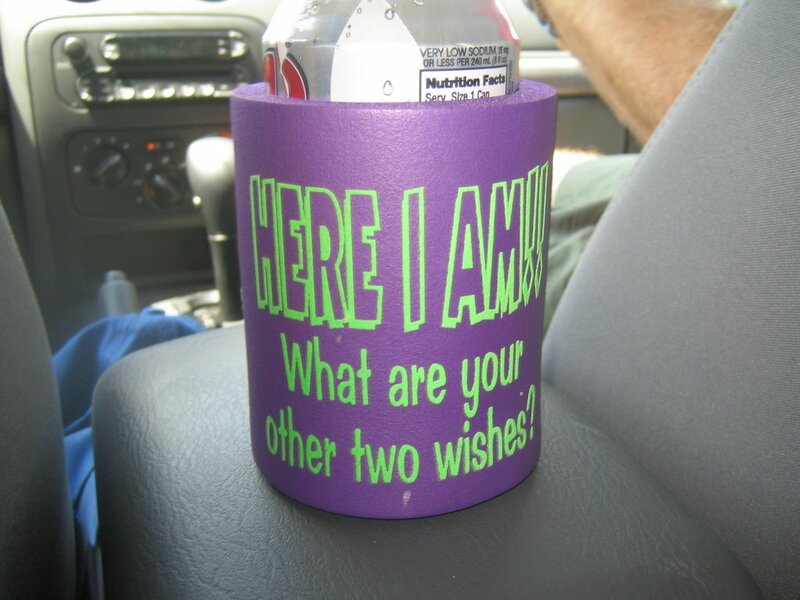 we all got a laugh out of this coozy. side note: i don't think i have ever been called upon to give a spelling for "coozy." until this moment, that is. dictionary.com isn't helping me out either. in case you haven't noticed, i have tried to maintain a certain standard of spelling ever since i wrote that blog about "definitely" and other misspelled words. (for instance, I just had to look up "misspelled"). see why having a blog is so much work? i really love the movie shopgirl. i just rented it from netflix for my 2nd viewing and tears have flown. it is really quite wonderful. what is not quite wonderful is that i have an ear infection. or swimmer's ear or whatever you call it. it kills.